I read The Da Vinci Code some time ago. I like mysteries, particularly ones that build momentum and keep you turning pages until the very end. Dan Brown is a skilled writer of this sort of fiction. The book has its villains and heroes, all well developed and interesting. I enjoyed the story. And the author prides himself on accuracy — at least of certain details. He assures the reader that The Priory of Sion and Opus Dei have a basis in fact. Indeed, "All descriptions of artwork, architecture, documents, and secret rituals in this novel are accurate." After all, a novel that is so intertwined with history as this one would want to be very careful to be historically accurate. Sure, the book is fiction, but the basic historical foundation should be sound. Unfortunately, the author has a cause to promote, goddess worship; and an institution to attack the Roman Catholic Church and Christianity in general. It seems like his prejudices have gotten in the way of careful history. He puts statements in the mouths of his characters that sound authoritative and historical — but many of them aren't. 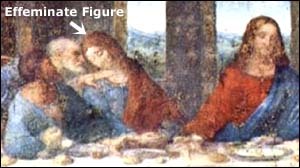 In Leonardo Da Vinci's "Last Supper" (detail, c. 1498), the so-called effeminate figure to Jesus' right is probably John, often pictured as youthful, without a beard, in Last Supper paintings. Throughout the story, the author identifies the Holy Grail (usually thought of as the chalice Christ used at the Last Supper) as a person — specifically Mary Magdalene, who, it is claimed, is sitting at the right hand of Jesus in Leonardo Da Vinci's "The Last Supper." Admittedly the figure is feminine and Da Vinci was weird. Symbols in the painting supposedly point strongly to this "fact." Now the author says: "The marriage of Jesus and Mary Magdalene is part of the historical record" (p. 245). He goes on to lay out his case from the Dead Sea scrolls and the Nag Hammadi Library which he calls "the earliest Christian records." This is ignorant and bogus. The Dead Sea scrolls don't say anything whatsoever about Mary Magdalene or Christianity. "And the companion of the Saviour is Mary Magdalene. Christ loved her more than all the disciples and used to kiss her often on her mouth. The rest of the disciples were offended by it and expressed disapproval. They said to him, 'Why do you love her more than all of us?'" The book refers to "the countless references to Jesus and Magdalene's union" (p. 247) and then tries to buttress his argument a passage from The Gospel of Mary (Magdalene), another third century document. All it indicates is that someone in the third century suspected a relationship between Jesus and Mary Magdalene. It was written long after the New Testament. The main male protagonist, Robert Langdon, turns to the female protagonist, Sophie, and nods wisely, saying, "Sophie, the historical evidence supporting this is substantial" (p. 254). Baloney! The author claims (p. 233) that up until the time of the Council of Nicea (323 AD), Jesus was considered only a man. He claims that, "Jesus' establishment as 'the Son of God' was officially proposed and voted on by the Council of Nicea.... By officially endorsing Jesus as the Son of God, Constantine turned Jesus into a deity...." Those who have studied the history of this Council know that the bishops in attendance already believed Jesus was divine. It is taught clearly in the Gospel of John, probably written in 95 AD. To imagine that "Constantine turned Jesus into a deity" has no historical basis whatsoever. Now the author proceeds to blame the church for suppressing the "true" story of Mary Magdalene's union with Jesus, and instead proclaim Jesus' divinity. The author claims: "During 300 years of witch hunts the Church burned at the stake an astounding 5,000,000 women." The number is probably 30,000 to 50,000, of whom 25% were men. This is a dark chapter of Church history. But Brown inflates the actual figure 100 times. Why? He is trying to villainize the Church. The book and now the movie version claim as historical facts flimsy theories concocted by the author to suit his slanderous attack on Christianity. Now is a good time prepare yourself for an onslaught of ignorance, as unsophisticated movie-goers are influenced by what they see. Arm yourself with the true history of Jesus, Mary Magdalene, and the Divinity of Christ, and you'll may be able to use conversations about the book and movie as opportunities to present the truth — and hopefully to lead men and women to faith in the true Jesus Christ, Son of God.